The opportunity to visit abroad countries had given me to taste many international dishes and delicacies. 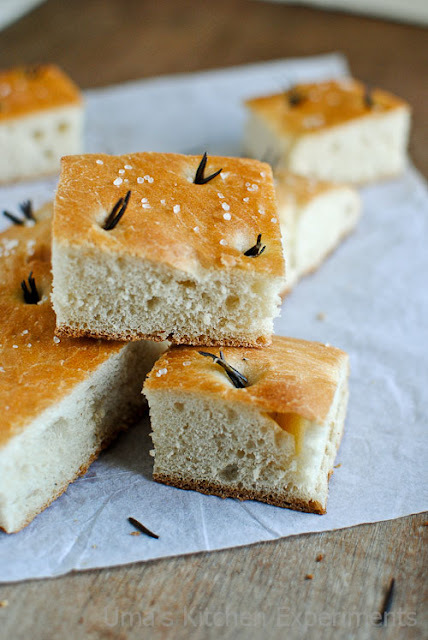 I have tried few easy dishes from them at home.Once I tasted this Italian focaccia bread from a local shop nearby during my stay there in abroad. It was the garlic one and it tasted so good. I liked the flavor and enjoyed eating it. After that I tried it at home after getting a recipe from here. I used the rosemary and sea salt for topping for the homemade version. Overall it is a good recipe to try and relax. 1) Take lukewarm water/milk in a bowl and mix both yeast and sugar. Keep it aside in a warm place until it get frothy. It will take approximately 7 minutes. 2) Now take a wide mixing bowl and mix flour and salt. Slowly add the foamy yeast mixture to the flour and make a dough. 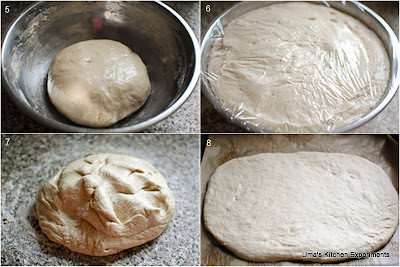 3) Add olive oil and knead it till you get very soft, moist, smooth, elastic dough. 4) Grease the mixing bowl with the oil. Coat the elastic dough with oil and keep it in the oil greased mixing bowl. 5) Cover it with a damp cloth or cling wrap and keep it in a warm place. Let it rise for an hour and until it becomes double in its size. 6) Punch it back and add little oil. 7) Place the dough in the baking tray covered with baking sheet. Form 1/2 inch thick rectangle or oval shape. 8) Cover it again using cling wrap. Let it sit for 10-20 minutes for the second rise. After 2nd rise, it will be in 2 inch thickness approximately. 9) Apply olive oil on top of it. Use more oil if you wish. 10) Place the rosemary on top of it and sprinkle some sea salt. 11) Place the tray inside the (205C or 400F) preheated oven for 20-25 minutes or until the top of the bread turns golden brown and spreads out nice aroma to the entire kitchen. 12) Cut into slices and enjoy warm. 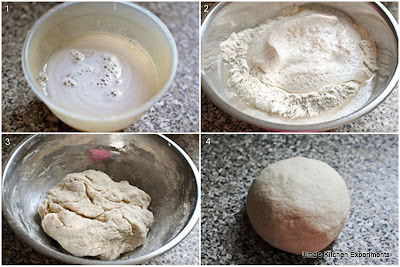 1) Depends on the texture of the flour you may require more or less water/milk to make smooth dough. 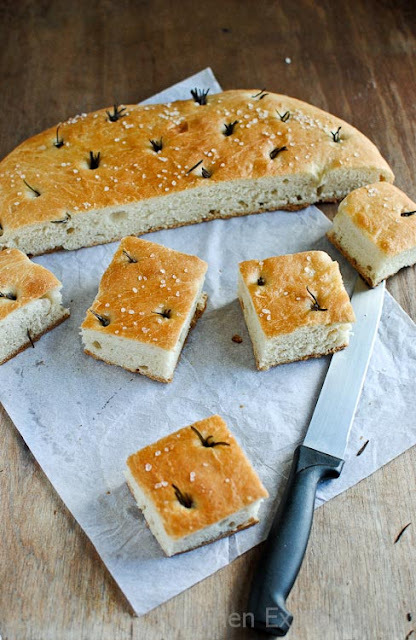 2) Try to use good quality flour and olive oil for perfect focaccia bread. 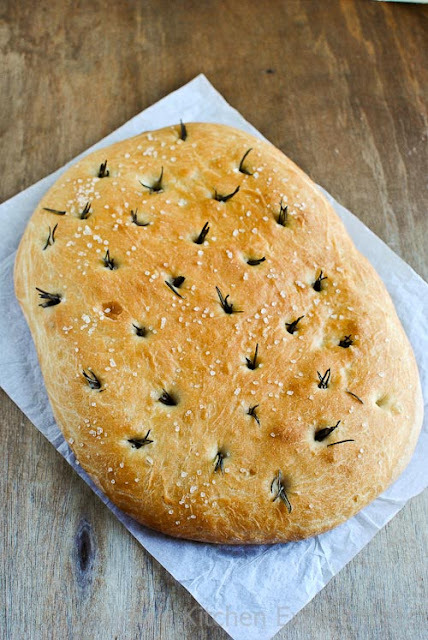 3) Alter topping for this bread as per your taste instead of rosemary and seasalt. Other topping suggestions: Caramelised onion and tomato, garlic and herbs, Olive and herbs. You can also use cheese. 4) Transfer the bread from the baking tray within 2-3 minutes to keep the bottom of the bread crispy. 5) Use only the tender rosemary leaves to avoid bitter taste of it. Don't use the woody stem of it. 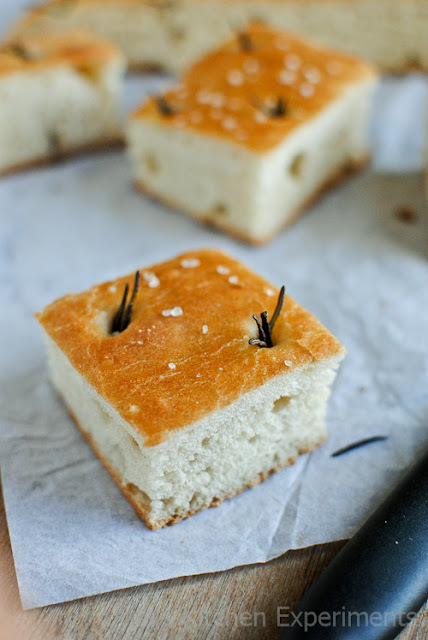 gorgeous looking focaccia, has a perfect crust on top..
Looks so soft and tempting... would love a bite.. Perfect bread !! looks so delicious !! 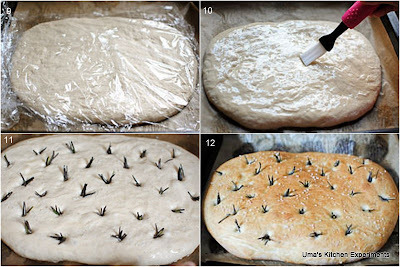 Rarely seen this much gorgeous and prefect focaccia,well baked Uma. The bread is pretty as a picture! Wowww looks so perfect....love it!